Like the political polling map a product scorecard gives senior management a quick overview of where actions need to be focused and which regions we need to invest in. Ideally we’d like everything to be green, but realistically a sea of three colors is what you’ll have to deal with. Let’s break this down into a few steps. 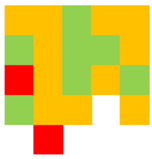 Let’s begin to view the scorecard from the previous post like an election map it makes the decision where to focus quite easy – forget about the red areas and try to move yellows to green. From this view we would first believe we would need to move all 11 yellow blocks to yellow. In reality, we need to prioritize and decide which ones are critical, which ones are possible, and which ones we won’t touch. 7 Green areas working as planned. 11 Yellow to rank. 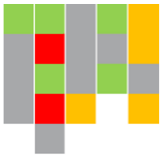 In the next step we need to go back to the scorecard details and re-rank the yellow areas in their priority as green, yellow and red. Once this is completed we need determine if the areas are worth the effort, and if we have the resources needed to make this change. 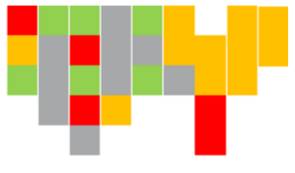 This map shows all Step 1 greens grayed out, since there is nothing left to do here, and yellow areas re-ranked from red to green. Now, instead of 11 areas we need to divide resources on we now have a mere 5 areas where we can concentrate 100% of our efforts. Re-ranking yellow from Green to Red. Applying this approach to your go-to-market analysis will help you to plan strategies and build better products. And since all the parts of a product go-to-market are tied together, focusing on these 5 areas should move more yellows to green so you are ready for the next product launch. Artefact: Go-to-market analysis map shown as the United States of the Product. – just for fun!